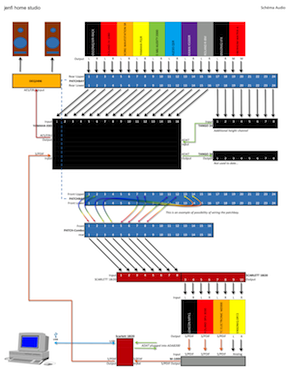 Here is the general block diagram of the audio wiring my home studio with the DAW ("STAN" in French). All equipment and connections ("connexion" in French) are represented. This makes a very overloaded plan. Each input and output used are shown. The console 03D Yamaha allows me to play without turning on the computer. I compose MIDI because it's easier to correct by the editor, and easier to change instrument with a simple "Program Change". When I am satisfied with my song I record it in audio in one or more passes — depending on the number of tracks and the composition — using Focusrite Scarlett 18i20 card. She has 8 inputs to which I attribute a particular synth or sound module by the patchbay Samson. I added 8 ADAT inputs on the Scarlett with the Behringer ADA8200. Then I mix in the computer (in the Box). I have 399 voices (maximum) sound resource and 104 channels multitimbral. To use as many channels it takes a MIDI interface with 7 ports (104/16 7). In shop, we find four, five, six or eight ports. The Midiman MIDISPORT 8 × 8 with 8 I/O ports is a good choice... In practice, my compositions are played between 6 and 24 instrument channels. Everything depends on the instruments used (not all at once!). Obviously, we must set the AMS Manager to reflect the distribution of the MIDI channels in the sequencer. 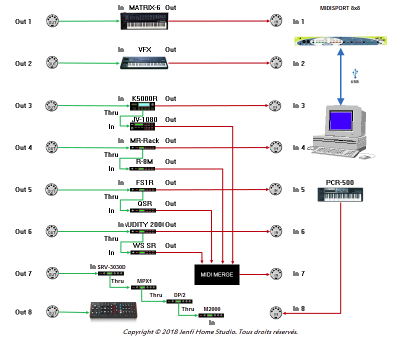 In the above table I have not said what is connected to MIDI IN terminals. So there MIDI OUT of sound modules Kawai K5000R in IN1, MR-Rack in IN2, Yamaha FS1R in IN3, E-Mu Audity 2000 in IN4, Oberheim Matrix-6 on IN5, Ensoniq VFX on IN6, and Edirol PCR-500 on IN8. This table reflects the distribution of MIDI channels managed into Apple AMS. I went from a wiring "Daisy Chain" (cascade connection) to a wiring "Star-Network" using MIDI Thru boxes Forefront Technology FT9 and Midiman Thru 1x4. Lately, I have sought to do a wiring MIDI "one for one". I had the opportunity to find a used (second hand) MIDI interface with 8 ports : the Midiman MIDISPORT 8x8. Nevertheless, "Daisy Chain" are needed. I unplugged all MIDI Thru boxes used previously. I no longer use the separate outputs of certain instruments because I have the opportunity to remake a another sound of the same sound module. The different effects are applied from the DAW. If I wanted to connect all main outputs (stereo) and separate outputs (auxiliary or sub) on the console, it would take more than 24 entries/channels. In my current setup, I don't lack of entries on the Yamaha 03D. In entries 23 & 24 I plugged my CD player. Like this, it's very cool to listen to CDs on my monitors. Modified page more than 1 year, saturday at 08h30mn.